Janowo near Narewka. It is surrounded with pine trees. That is a perfect place for tourists who seek for peace and tranquility and are willing to observe nature and take part in canoeing as well as bicycle tours. This new, three-storeyed, brick building is beautifully integrated into the surrounding landscape. The office, kitchen, dining room and the huge television room with fireplace are to be found on the ground floor. There are nine rooms on the first floor, including one room with three beds and bathroom and four studio rooms. One studio consists of two rooms, bathroom and a hall. There are twenty eight places available in the moment. Because all rooms are spacious, there is a possibility of putting four additional beds and increasing the number of places to thirty two. After second-floor renovation the guest house will offer fifty accomodation places. The attic plays a role of the observation point on the Narewka River and the Bialowieza Forest. During summer holidays tourists can take advantage of bike or canoeing rental. After finishing canoeing guests can eat lunch or dinner and spend time at the bonfire or barbecue. integration events, weddings, feasts, christening parties, funeral receptions and other occasional events. Two big ballrooms have the capacity of eighty people. The service provides consumption and dance party. Calculations will be done on the basis of individual arrangements. The cost of stay per one person per day (including night, breakfast and dinner) 58 zlotych per person per day. The cost of stay per one person per day (indluding night, breakfast, dinner and supper) 73 zlotych per person per day. The stay of every sixteenth person is free. For groups staying more than three nights we offer bonfire feast with sausages for free! The cost of stay per one person per day (including night and breakfast) 60 zlotych per person per day. The cost of stay per one person per day (including night, breakfast and dinner) 85 zlotych per person per day. 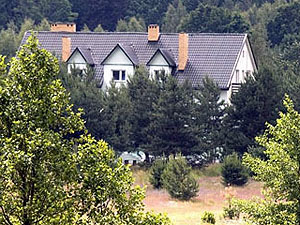 The cost of stay per one person per day (indluding night, breakfast, dinner and supper) 100 zlotych per person per day. The stay of every twenty first person is free. For groups staying more than three nights we offer bonfire feast with sausages for free! In case of longer stays and optimal use of family studio rooms there is a posssibility of negotiating the price. Children under 3 or sleeping on parents` bed or in their own crib are accomodated for free. For groups staying more than three nights we offer bonfire feast with sausages for free!